Amid the chatter about Snap's (SNAP - Get Report) slowing user growth, lack of profitability and fierce competition with Facebook (FB - Get Report) , it's easy to forget that the Snapchat parent company also has a hardware business. But the hardware business could soon be getting a face lift, according to TechCrunch, which reported on Monday that Snap could release a new version of its video-recording Spectacles in the coming months, citing sources close to the situation. Snap could release a new version of them with augmented reality-features that use sensors to determine a user's location and to overlay graphics (such as lenses and geo-filters) onto the space around them. It would mark the first update to the $129.99 glasses since the product was released last November. Representatives from Snapchat weren't immediately able to verify the report. Snap shares have fallen more than 10% in the last week amid concerns about user growth. On Monday, they rebounded slightly, up 0.7% to $18.20, but are still down about 25% from the close on its first day of trading. Snap's recent patent filings seem to support a new AR-enabled version of Spectacles. A filing published last month describes using "image based tracking in AR systems" like an AR helmet, visor or glasses. The AR-powered wearables would then be connected to a smartphone, the patent noted. The feature could be used for all kinds of fun scenarios, such as one image that shows a Tyrannosaurus rex running through a city street. While users might be excited by the possible features, it's unlikely to move the needle for Wall Street analysts who remain laser-focused on the company's ad revenue and user base. Even for a business that calls itself a camera company, Spectacles haven't made much of an impact on Snap's overall finances. Out of Snap's total sales of $149.6 million in its fiscal first quarter, Spectacles generated about $8 million, an increase from the $4.5 million in revenue they generated in the previous quarter. Snap said sold about 61,500 pairs of Spectacles during the fiscal first quarter at a retail price of $130. Snap said on the company's earnings call that it has been pleased so far with Spectacles' success, but acknowledged that the product has had a limited impact so far (a point first made in the company's IPO prospectus). "It's a modest program for us right now," CFO Drew Vollero told investors on the call. In terms of consumer adoption, the market for AR smartglasses is at a much more nascent stage than mobile AR in general, said Tim Merel, managing director at Digi-Capital, an AR and VR M&A advisory firm. AR smartglasses aren't likely to become commonplace until 2019, while mobile AR is already in the hands of consumers through products such as Snapchat's world lenses, Alphabet's (GOOGL - Get Report) Google Lens, Apple's (AAPL - Get Report) ARKit and Nintendo's (NTDOY Pokémon Go, among others. Mobile AR presents a huge opportunity for tech giants to add additional users and revenue. Digi-Capital predicts that mobile AR will garner over one billion users and $60 billion in revenue by 2021, while AR smartglasses could deliver tens of millions of users and less than one-third the revenue generated by mobile AR. In the long term, it makes more sense for Snap to focus on mobile AR rather than Spectacles, which for now, are mostly just a "great marketing tool," Merel added. "AR smartglasses could be a large market for Snap in the long term, but Snap needs to fight the mobile AR platform war now," Merel explained. Snap might also need to reconsider its decision to keep its mobile AR platform closed to developers. Facebook and Apple both have open source AR developer platforms, as well as much larger user bases, Merel added. Snap CEO Evan Spiegel continued to defend his decision on the company's earnings call last month. "I think in terms of our hardware strategy, our approach, when we're exploring kind of new technology is to usually work on it ourselves," Spiegel said. "That's usually the best way for us to explore something really, really quickly and really learn from it. And so, that's been our strategy today with Spectacles." Facebook has been able to capitalize on Snap's AR momentum by opening its platform up to developers, said Loup Ventures analyst Doug Clinton. But Spectacles could be one of the "few legs up" that Snap has on Facebook if they make the right moves, he added. Snap seems to recognize that Spectacles aren't supposed to be a major revenue source, but rather a creative tool to find out what consumers like and want, which is data that could be monetized later on down the road. "Facebook doesn't have a hardware product in the wild getting real user feedback," Clinton noted. 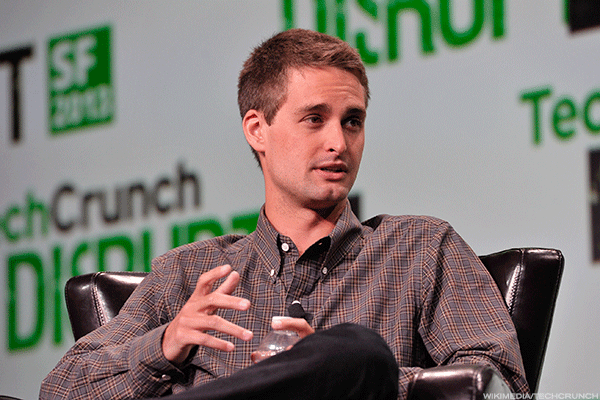 "So Snap should look to optimize that advantage as much as they can in the near term."